The US military has tried a broad range of dune buggies for military service, and among the most successful has been the M1040 Hellfire Fast Attack Vehicle. This Army-issued buggy spent nearly a decade on the front lines, meant as a harassing unit for the long expected Soviet invasion of western Europe through the Fulda Gap. Armed with the Army’s heaviest ATGM (Anti-Tank Guided Missile), the TOW, each Hellfire carried the capability to knock out two platoons of Soviet armor. In addition to patrolling the Fulda Gap, the Hellfire also put in time with the USAF as a base security vehicle in the western states. A large number of them are also used by the Department of Energy’s SRT units to patrol nuclear test sites in the same region. Lastly, between 1982 and 1985, a pair of Hellfires were modified by the US Navy, serving as testbeds for many of the teleoperation system that make today’s numerous unmanned vehicles possible. 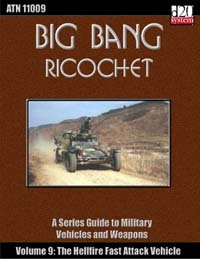 Included with this book is an extensive writup of the BGM-71 TOW. This heavy anti-tank guided weapon, with more than 620,000 missiles manufactured since 1970 and serving in 46 countries, is the most widely distributed anti-tank weapon in the world and has seen military use in no less than seven conflicts around the globe in the last 35 years.